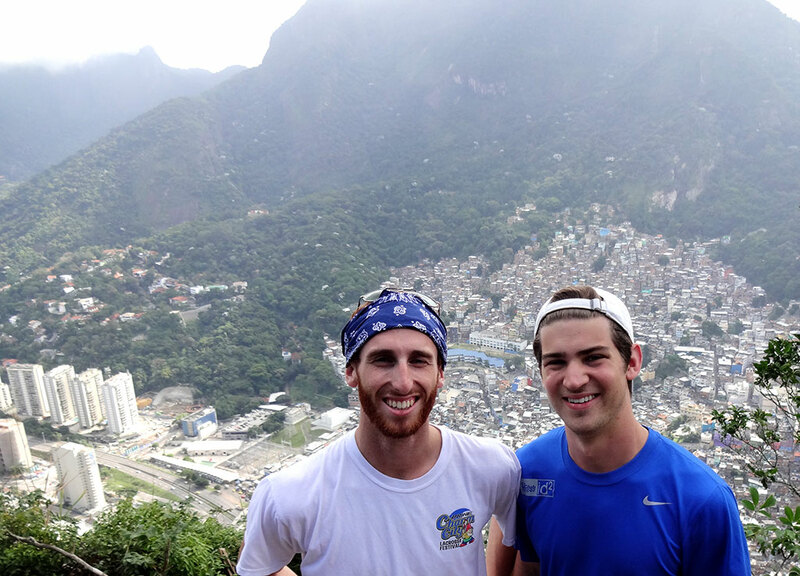 Seniors Jack Mitchell and Joseph Gelay used UofSC's undergraduate research program to conduct hands-on research and fulfill lifelong a dream at the World Cup in Brazil. For the last few weeks, Brazil has been at the center of the world's attention as the best soccer players from across the globe compete for the ultimate trophy. Amidst the fans and excitement, the cheers and the tears, two University of South Carolina students reached the pinnacle of their college experience at this year's World Cup. "This encapsulates everything I've learned inside and outside of the classroom," says Joseph Gelay, a senior sport and entertainment management major. "The whole experience felt like a capstone project. Everything that I've been learning since freshman year – and not just marketing classes. It was like an icing on the cake in college. It was everything thing we've worked for." Gelay and roommate Jack Mitchell put their coursework to the test in the field conducting research on the world's biggest field in Brazil. The two College of Hospitality, Retail and Sport Management students found UofSC's Magellan Scholar program to be the perfect opportunity to advance their studies and make a life dream come true. The program funds $3,000 for undergraduate students across the UofSC system to research any discipline alongside a faculty mentor. 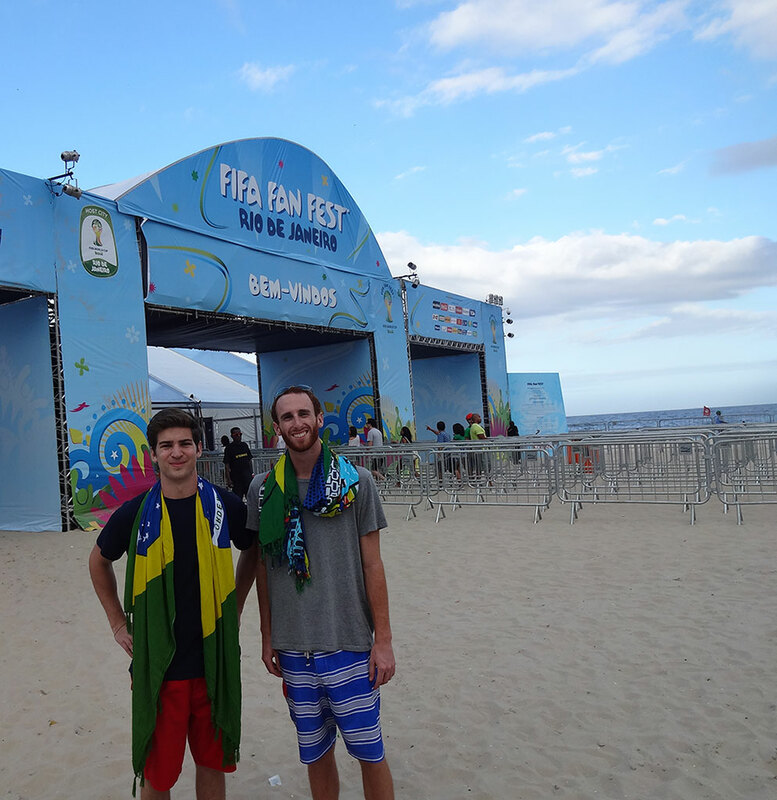 "We felt with the World Cup coming up it was a unique opportunity to experience one of the biggest events in the world from an academic perspective," says Mitchell, a senior sport and entertainment management major. 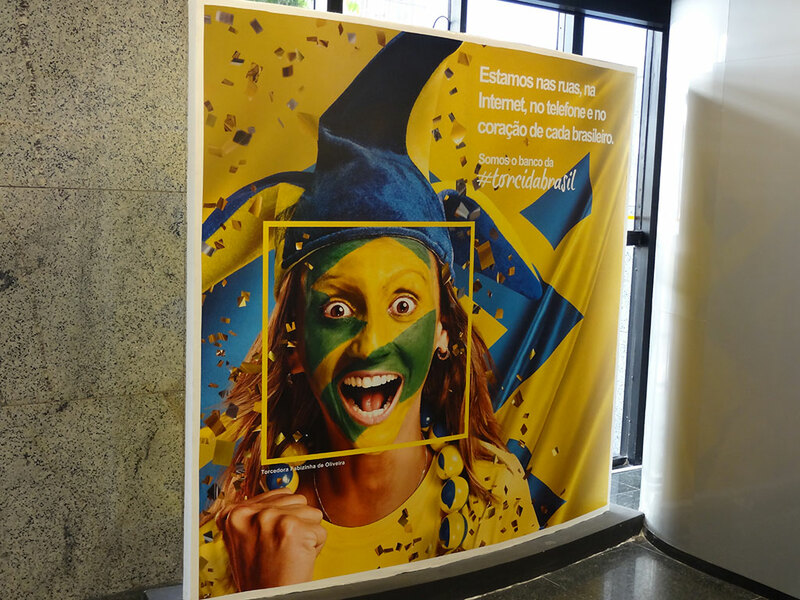 Working with professor John Grady, Mitchell and Gelay researched ambush marketing – when brands use major events to market products without going through official channels – on the ground in Rio de Janeiro. For example, Adidas is one of the official sponsors of the FIFA World Cup, but companies like Nike take advantage of the global audience to market their brand across Brazil and associate their brand with the World Cup, Gelay says. Part of the students' project was examining how FIFA handles and protects its official sponsors from ambush marketing practices. "We did an ambush marketing project junior year and we decided we could use that to get funding to go down to the World Cup," Gelay says. "I've been a huge soccer fan my whole life and this fell in the perfect place. Being at the event, really reinforced all the concepts I've learned in the classroom. There's a lot about being there in the space that you can't see on the TV." It wasn't all work though and the students say they loved experiencing the culture and the soccer culture of Brazil. They took breaks from research to spend time on the beach and explore the city. "It was like being in a huge soccer heaven for 10 days," Gelay says. The students hope to get their research published and plan to present the project at the university's annual undergraduate research expo Discovery Day in the spring. For both students, the project has influenced their career goals as both hope to get jobs in sports marketing after graduating. It was undergraduate research opportunities that first attracted Gelay to Carolina. Three years later that decision paid off. "Both my research experiences will be what I will look back on the most," he says. "I think research is a great way to take everything from my college experience and turn it into something palpable and real." Mitchell agrees. "Not a lot of schools would give you the opportunity to go to another country for 10 days for research and be able to write a paper with a professor who knows so much about it," he says. "It's more than any classroom experience. This is something that's real." To learn how you can help support undergraduate research projects like this one, visit Carolina's Promise.